Margaret Robertson (Mrs. W. H. Kendal) married William Hunter Kendal while they were both in John Buckstone’s troupe at the Haymarket Theatre, London. The two from that time on always performed together, for a time in a company that included a young Ellen Terry in 1861. She and Terry became lifetime friends. Married in 1869, both were excellent managers, but Mrs. Kendal was always praised as the better performer. Both were especially praised for their parts in comedies. Madge, however, was also acclaimed for her portrayals of Shakespeare’s leading ladies: Desdemona, Ophelia, Lady Macbeth, and Blanche in King John. The Kendals managed St. James’s Theatre in London between 1879 and 1888. In 1902, Madge performed a revival of The Merry Wives with Beerbohm Tree as Falstaff, herself as Mistress Ford, and her friend Dame Terry as Mistress Page. 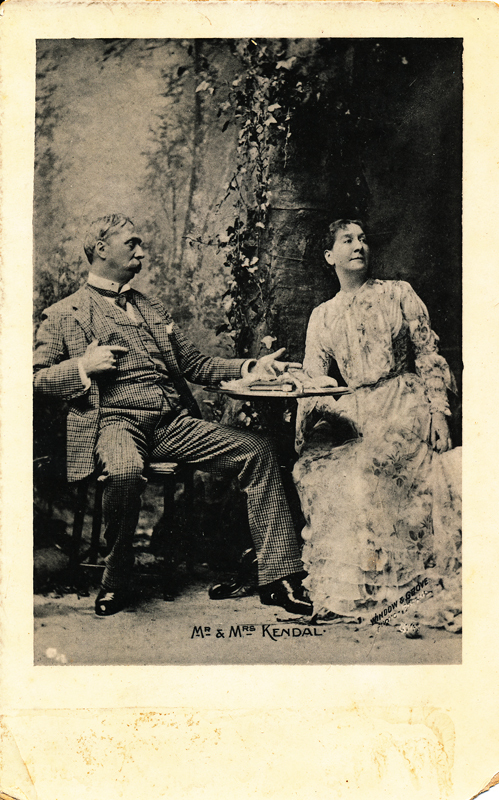 The Kendals retired from the stage in 1908 after many successful partnerships with various theater owners. Mr. Kendal died in 1917. Madge was made Dame Commander of the British Empire in 1926, and in 1927 she was awarded the Order of the Grand Cross; both honors acknowledged a long, distinguished career on the stage. Madge is a character in the 1979 film, The Elephant Man, and was played by Anne Bancroft.